“It’s peaceful in here,” plus some math, Sam-style. 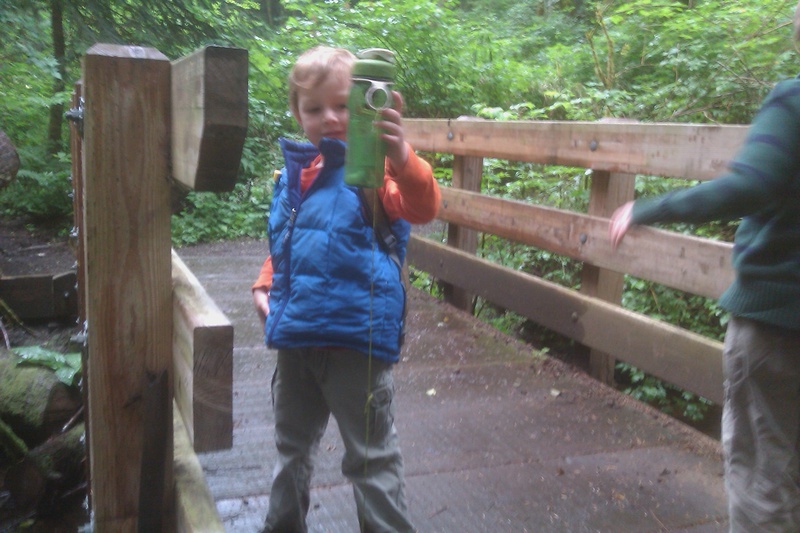 Little trolls found the cache at Hidden Cove! We had the trails to ourselves today - completely and utterly alone out there. No dogs charging us, no chatting moms, no running of the bulls (ooops, I mean boys)...Ben said on our way back to the truck as we talked about hearing only the pitter patter of rain "It's peaceful in here." I don’t want to forget something Sam said last week on a hike with a friend of ours. She was talking about her son leading a bike trip for teens down the state of VT. We guessed it was 300 miles long top to bottom, and he had 15 days to make the trip. How many miles would they do a day?, she asked. Sam was quiet for quite some time. She started with 15 times 2 is 30…Sam was still quiet. Finally he came up with an answer (I don’t remember what it was, but it was a bit off, so we started working through how he got it – the process was so interesting). I think he started with figuring out how many 15s there are in 90 (6); then how many 90s in 300 (trying to get close to 300) – 3 and a third he said. So he’s at 270 with 3 90s; and 6 15s in each 90. That leaves 30 miles to spread across 15 days – 2 each day. So if there are 6 15s in each 90, and three sets of 90, then 6×3=18 plus those extra 2 miles each day is 20 miles a day. I was sick that week, so it literally took me the entire drive home to figure out what he had done. Last night I remembered it, and wanted to write it down, so this morning I tried to recreate it using the pieces I remembered (6, 90 and 3 1/3) but couldn’t. So I just woke Sam up and had him help me. My goodness his head works in interesting ways. He juggles a lot of pieces when he problem solves. He really pictures the parts moving around in a way I don’t naturally do. You know summer is when scool is out. Most of the time good things are hapining. Not onle around me but to me. One of my favrits was Mindstorms! Kitsap reginel Librare (KRL) sometimes has speishle events. Sometimes it’s spechis like Orion the owl. And some times Enginnering. Like Legos at the Lirare, and a Cardbord Marble runs. I also ingoed, swimming Lessins, Lorning about Lewis & Clark, And I loved programing my Mindstorm! W also got Brikes from the old Wilkes skool! 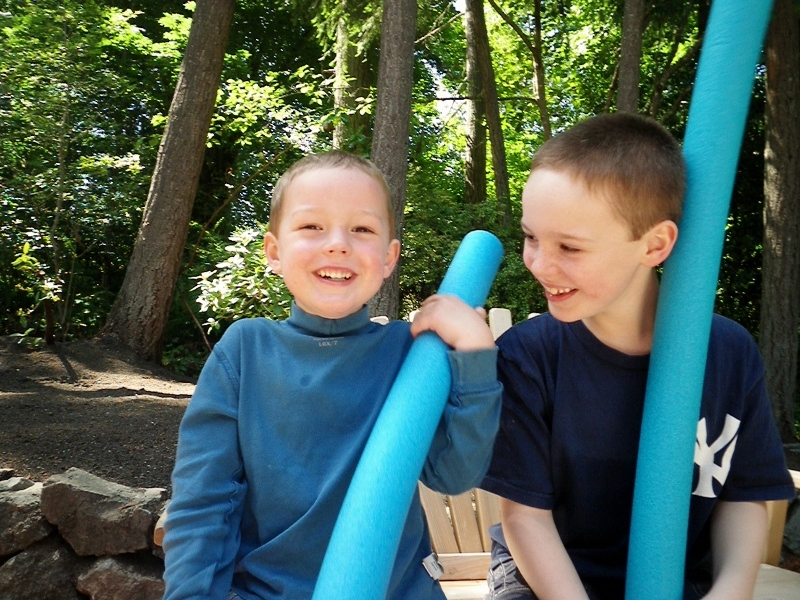 CLICK ON PICTURE FOR NEW JUNE PHOTOS | Ben said something hilarious about his first experience at a gym class yesterday. The only thing he did well (and better than the sweet, cuddly girls) was "stiff-as-a-board" where you lie down stiff and the instructor lifts you up by the shoulders to a standing position. He did that great. He's been stiff as a board since birth - you try to hug him and he kicks and stiffens. So I told Dave that story about gym class last night at dinner and Ben goes "Yeah, just like HollyRamona" - the hen who expired a week ago. When I carried her to the maple tree to bury her with Ben, the morning of the water gun war, she was stiff. We talked briefly about why, so maybe that's why he remembers. He is TOO much! You know summer is when scool is out. Most of the time good things are hapining. Not onle around me but to me. One of my favrits was Mindstorms! Kitsap reginel Librare (KRL) sometimes has speishle events. Sometimes it’s spechis like Orion the owl. And some times Enginnering. Like Legos at the Librare, and a Cardbord Marble runs. I also ingoed, swimming Lessins, Lorning about Lewis & Clark, And I loved programing my Mindstorm! we also got Brikes from the old Wilkes skool! I just tucked the little chicken babies in and said goodnight to them. They are so cute, and eating a LOT! Today I had to replace their feeder because, despite the inscription “Quality since 1941,” on the front, the little trapeze artists managed to unscrew a tiny nut and washer holding the whole thing together. After hunting for a tiny nut in the poopy straw once a day for two weeks, I finally gave up and went to Bay Hay to get something different. I was beginning to feel like Sisyphus. And I don’t have time for that sort of stuff. Nor the patience. I am feeling instantly better about things with an operational feeder. But, I do have a cold, and I am not a happy camper when I’m slowed down. Work doesn’t slow down for the one-woman show, either, so no sick days for me. I can’t believe, honestly, what I have worked through in my 6 years of self employment. Puking boys (2 of them), towels thrown down the hallway for a runway to the bathroom AND a computer crash in the middle of a very large report for a state health department. No way to push out that deadline. That’s among the most memorable. Oh, I had been puking the night before, too. And cleaning up after boys while Dave tried to stay isolated and uninfected in another room. Here’s an email I just sent. Thought you’d enjoy Sam’s take on perseverance. Well said. BUT they packed 4 oz of whiskey for each man for their journey! Thought you would laugh. It was a good reminder. I’d thought of that myself the day before. The inspiration I mean, not the whiskey. Although, now that I think of it… kidding! As a Father’s Day present, Ben and I decided to just take his training wheels off on Thurs and GO FOR IT right on our driveway. And so we practiced a bit Thurs and Sat (Fri was the great water gun war), hoping to surprise Daddy with a stellar first ride at Battle Point Park on Father’s Day. Sun was Dave’s first day off in three weeks, so we decided not to add angst to it by doing the very FIRST ride without wheels – I would handle that in private with Mr. Ben. (We had a very interesting time of it when we perhaps too ambitiously tried to take them off before he turned 4 while down at Mom and Richard’s. So we were a tad apprehensive. Sam took his wheels off at 4 yrs and 1 month old, and literally biked away down the hill as if it were no different for him. It was not the same for Ben, who had not had the same amount of regular practice – you have to really make a project of getting to a place conducive for biking with kids.) Anyway…this weekend Ben was just shy of 4 yrs and 1 month old, and so it was time to just do it. We went to Battle Point Park yesterday afternoon for the big event. Sam on his bike, Ben on his. I had a cold and was feeling not-so-great. Ben biked down a few hills – pretty steep ones some of them – and did great. He flopped around on his bike for a bit on the steepest one, looking for a way to stop the bike and not finding it, just kind of leaned over, belly on his seat, legs flying behind until he came to a roll. It was pretty funny. Then we biked on the bike trail – 3 ft wide and gravelly. Lots of families out for a nice Father’s Day walk, kids and dogs in little jackets. We didn’t check with Dave first – we just took off. And what ensued is exactly what Dave knew would happen – it was a high-speed chase with me in hot pursuit, barely keeping up on the flat. On a grade…well…I was hoping for the best. We saw Dave far in the distance trying to close the gap with us by running across the park – he popped up and surprised us, all smiles. We were so elated to be out on wheels, doing fine. One half-mile down, one mile to go to circumnavigate the park. It really went well and Ben was thrilled to be biking along. Until we came to a down-grade that crossed a little culvert thing over the pond. The path is about 6 ft wide there, no railings, and a steep dip into the pond on either side unless the brush stopped you. Across the culvert I spy a 10 yr old on a wide recumbent bike taking up half the room. Now Ben is an aware guy, and he would try to miss this guy if he could. So as I’m yelling “SLOW! COOOAAST!” I race to close the gap. Just as I reach him, he veers left to the edge of the culvert. But you never know if he’s being intentional (doing an S as he proudly showed me earlier) or about to take a nose dive. Sam was worried about giving him enough room so Sam veered right. They were both INCHES of going into the drink! I was hyperventilating as we came to a screeching halt on the other side of the recumbent biker. 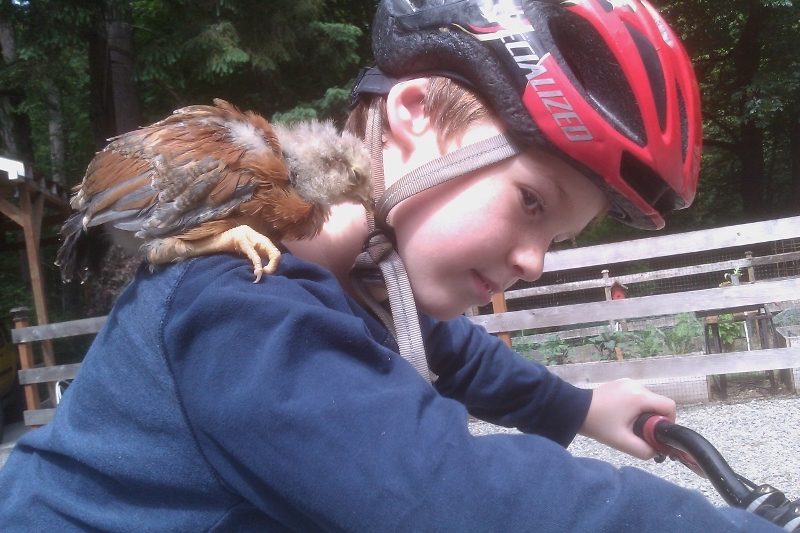 Moms were passing by wide-eyed – I tried to explain it was his first time without training wheels. We enjoyed a Father’s Day/birthday/training wheels off dinner at Doc’s and way too much dessert. A good day…I have no pictures of this event because it was such a whirlwind. But I hope this description gives you as sense of the fear and elation which accompanied the big day! Bravo, Big Ben. You are TOOOO much. 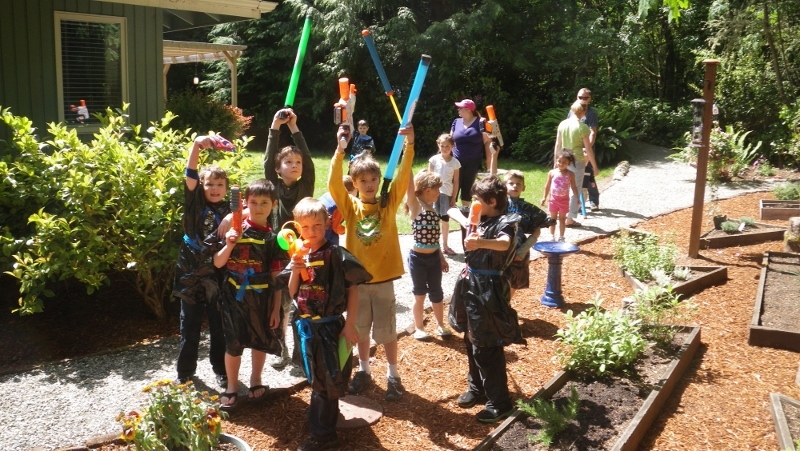 Summer is here – water gun war! HollyRamona - you dear, sweet hen. You were much loved by many. Rest in peace. This is HollyRamona out for what turned out to be her last recess yesterday. 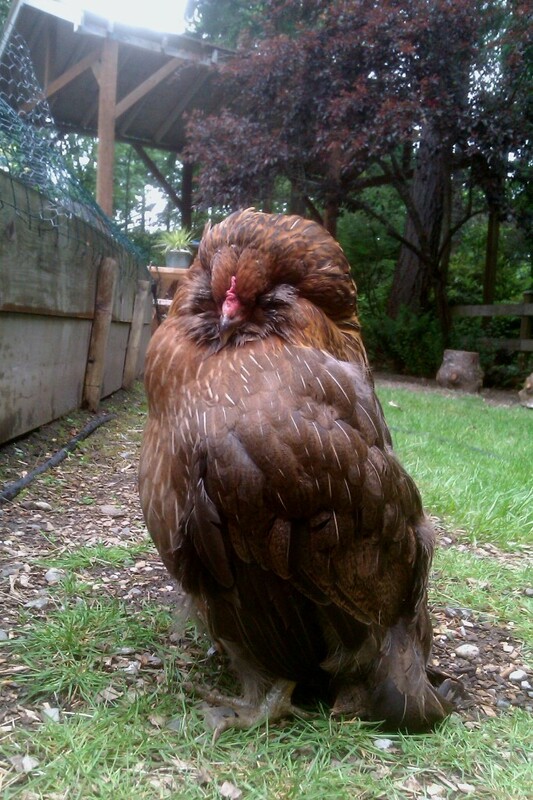 The dear sweet hen had been in decline for months, but always managed to rebound a bit when we thought we’d said goodbye. Yesterday, though, she was falling asleep standing up. This is what she looked like, very regal. The past week or so she’d stand much like this and watch the other chickens scratching – she looked like a sweet little penguin, or maybe even an owl, standing guard. I am so thankful she passed peacefully early this morning. You will be much missed. Those who love animals will understand the special connection we have with some animals. Some are pets, and some become dear friends, and some even become examples of character traits we can all aspire to. You, sweet hen, were indeed a “factory of sweet” as Sam called you. Always gracious, never (ok, rarely) pecky, always regal and refined. Graceful and proud even on your last recess. This morning Sam said goodbye just before school. He was sad, even amidst all the excitement of bringing his guys home from school for a big water gun war. And Ben helped tuck you under a blanket of soft earth, topped by a stump. All chickens love stumps. Ben and I talked about you playing with Polly up in Heaven. Then Ben asked if your whole body was IN earth. I said yes. Then he wanted to know which part went to Heaven. I explained that the part which made you sweet, the part of you which is your character, went up into Heaven. “What is a character?” It’s a property of something, like gases on the planets have properties (Sam loves space stuff so Ben knows a little about gases, I think), water has properties (being liquid). So we all have properties. Hers was very sweet. Now we can enjoy thinking about integrating the young babies into the flock. And a water gun war which starts in about an hour!!!! I have the guns lined up, the hose ready, buckets filled, a table ready for 4 large pizzas, ice pops, goggles, snow saucers for shields (the moms are getting in on the war!) and the sun is shining for the first time in days. A beautiful morning. On the way home from arming up for our super soaker water gun war on the last day of school (all boys in class invited), Sam said "I think this is the best day of my life. Mindstorms, Super Soaker, and water balloons. All in the same day." 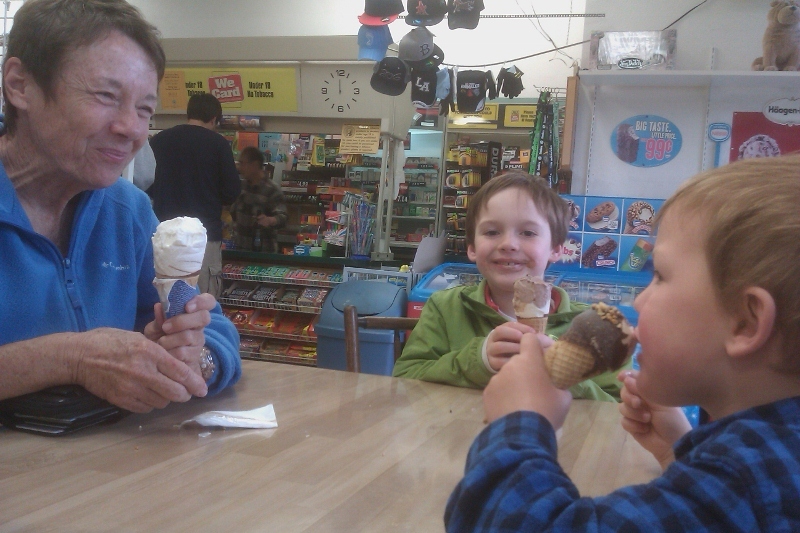 Mom has been such a huge help the last couple days, diving right into the madness of two boys whatever that brings. Tonight she wrangled them in from an impromptu water gun war with the neighbor’s boy right at dinner time. The only reason she got Ben, undressed to the underwear, dried off and re-clothed is because he was shivering! His upper lip was still blue at dinner! Sam was soaked and cold, but going strong still – exhilarated with the power of the Super Soaker 🙂 Mom also did more Moss Out on the grass and tried to fend off the dreaded Archangel super-weed which grows no matter what you do to it. This invasive ground cover has one of our neighbors hyperventilating when she see it spreading, poor thing. Maybe we should load up the boys with chemicals in their water guns and have them hunt the ARCHANGEL???!!! Whooohaha haha haha…. Quick picture taken on a field trip to a local farm with Sam's class. Ben and I accompany the class as chaperones whenever we go to farms - the week before they went to Suyamatsu-Bentryn Family Farm, where the local farm stand is located. This time we went to another farm with meat cattle, sheep (also meat), and a bunch of chickens. 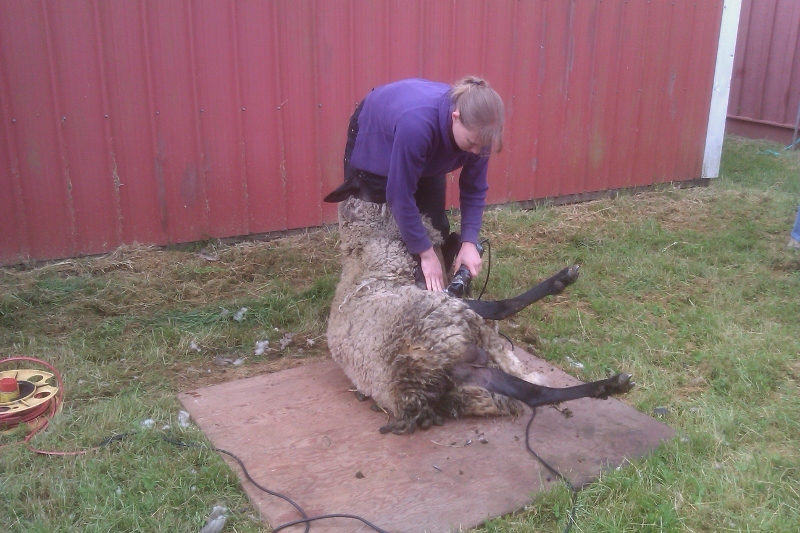 The sheep were getting shorn. I think that's the right tense? I didn't have much time to snap pictures while shepherding my three boys (the ones assigned to me) plus Ben! We got to within 3 feet of these friendly cows. It was really fun! Ever interested in alternative careers, I chatted up the very professional sheep-shearer, Mary. Is that a STEM career? 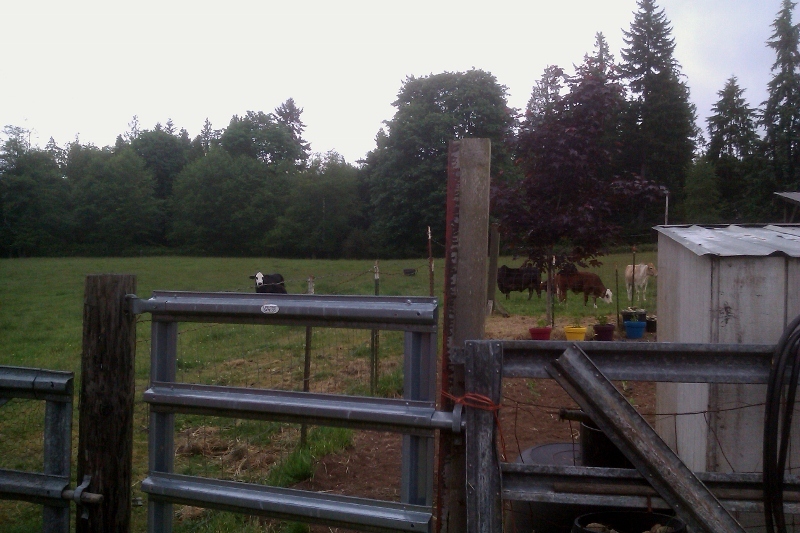 She is so competent and I envied her very much, working on the farm, in her Carhartts, outside with the animals. All my love for those James Herriott books came right back. It was even grey out - an English countryside day. Mary had a not-so-little lamb! Lookie who flew into town and surprised us!!!! WOW-EEE! Hi Gramma! Boy what a story went with that. I thought it was an intruder peering through the bushes, trying to see if I was at my perch. Mom wanted to sneak up and surprise me. That is hard to do, especially in the morning when I'm all caffeinated and charged up after doing periodic battle with MERLIN. I saw the face peering through the bushes, fiddling with something. Very suspicious. Then the face retreated and started heading down the road. Thinking the zombie apocalypse had arrived on Bainbridge (I know this isn't funny, but I'd just read those disturbing stories and that is what first came to mind, that seriously it was a deranged high schooler out there, who was about to overheat and rip his clothes off, coming after me and the boys). So I ran out the back door, thought about grabbing my hoe or my machete, but didn't want to lose the "track" of the zombie as it headed off. I got to the road and saw "it" heading away, looking oddly like my mom from the rear. I yelled "CAN I HELP YOU???!!!" "It" turned around. Mouth and eyes wide. Agape. Then eyebrows up and a big smile, and "OOPS!" Ahhhh...it was mom. But I was simultaneously relieved and still confused. Had mom forgotten where I lived? Had she gone mad? Quite a few laughs have been had over this endeavor to surprise me. She said she wished she had a picture of my face - I think she's just lucky she didn't meet with my machete! You should see what I do with a dull one around here. It's been fun, mom!! !